Btw, merry christmas to all of you! I've always wondered as to the helmets worn by Alexander in battle... does anyone know which types he wore in his various set piece battles? Do you guys think it was ornate and exquisitely handcrafted with artistic embellishments and feathers, plumes, the works, or did he just wear a plain thracian or boetian helmet? Come live forever with me, or transpire / a flame alone on a funeral pire / We'll build an empire if we so desire, travel the world, and set it on fire. Would be cool to see one of the helmets... there probably were a lot of ornate and lavish features to the helmets... didn't he have white plumes on his helmet at Issus? robbie wrote: I've always wondered as to the helmets worn by Alexander in battle... does anyone know which types he wore in his various set piece battles? 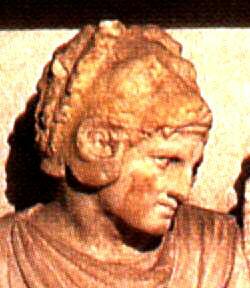 Plutarch, Alexander, 32.5-6, wrote:  After sending this message to Parmenio, he put on his helmet, but the rest of his armour he had on as he came from his tent, namely, a vest of Sicilian make girt about him, and over this a breastplate of two-ply linen from the spoils taken at Issus. His helmet was of iron, but gleamed like polished silver, a work of Theophilus; and there was fitted to this a gorget, likewise of iron, set with precious stones. He had a sword, too, of astonishing temper and lightness, a gift from the king of the Citieans, and he had trained himself to use a sword for the most part in his battles. He wore a belt also, which was too elaborate for the rest of his armour; for it was a work of Helicon the ancient, and a mark of honour from the city of Rhodes, which had given it to him; this also he was wont to wear in his battles. The Phrygian helmet worn by Alexander on his own Porus Medallions is the most authentic case. 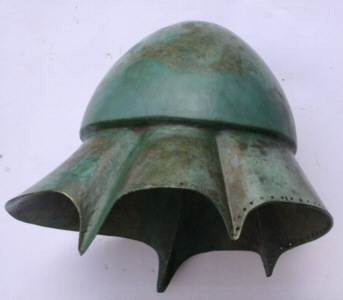 A similar helmet was found in his father’s tomb. 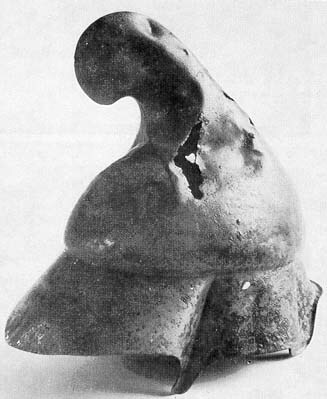 Such helmets are also worn by other Macedonians in contemporaneous tomb friezes. 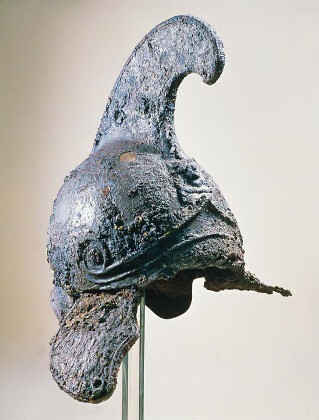 Macedonian cavalrymen also wore Boeotian helmets. 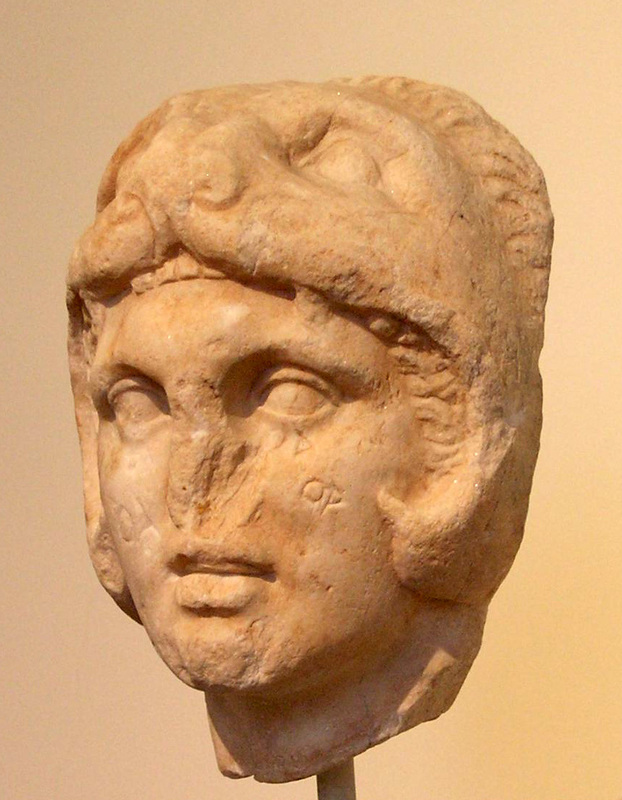 Alexander also seems to have owned a helmet imitating the Nemean lionscalp of his putative paternal ancestor Heracles. He wears it on the Alexander sarcophagus, probably in the Battle of Issus. and also in some other early portrait sculptures. Many rushed upon Alexander, for he was conspicuous by his buckler and by his helmet's crest, on either side of which was fixed a plume of wonderful size and whiteness. But although a javelin pierced the joint of his breastplate, he was not wounded; and when Rhoesaces and Spithridates, two Persian commanders, made at him together, he avoided the one, and smote Rhoesaces, who wore a breastplate, with his spear; and when this weapon snapped in two with the blow, he took to his sword. Then, while he was thus engaged with Rhoesaces, Spithridates rode up from one side, raised himself up on his horse, and with all his might came down with a barbarian battle-axe upon Alexander's head. Alexander's crest was broken off, together with one of its plumes, and his helmet could barely and with difficulty resist the blow, so that the edge of the battle-axe touched the topmost hair of his head. I will regard this as an early christmas gift!!!! Awesome!!!! !Thank you so much..... one of the most incredible pics I've seen... you are an angel, my friend!!!!!! I enjoyed reading it... so rich with information... thanks!!! I knew there was a more specific description, including the plumes; but couldn't remember where it was. Nice one!